All of the tangy, spicy, bold flavors transformed into a mouthwatering easy mixed green salad! This healthy Buffalo Roasted Cauliflower Salad recipe is vegan, gluten-free, and the perfect meal to add into your lunch rotations! Sometimes you just need those lazy meals where you don’t want to put in the effort, but want that same taste and deliciousness. I’m in that lazy mood at least 2-3 times a week, especially on the days my youngest is in school for half-day, and it’s just me for lunch. Well lucky for you guys, one of those lazy whip-up meals turned into this delicious flavor-packed easy and healthy roasted cauliflower salad recipe! I’ve roasted cauliflower before and LOVE it, but this particular time, I wanted something a little more tangy and spicy, yet easy, healthy, and quick. So what did I do? I took my Buffalo Cauliflower Bites recipe, skipped the breading step, and went straight to the sauce and roasting. As if my buffalo cauliflower bites aren’t already easy enough to make as is, this particular recipe is even easier! My initial plan was to eat them straight from the baking sheet with some of my popular vegan cucumber ranch that I whipped up in 5 minutes and call it lunch, but then I knew I’d be hungry again in an hour and may miss the breaded part of the recipe. So instead, I threw together this awesome salad combination!! 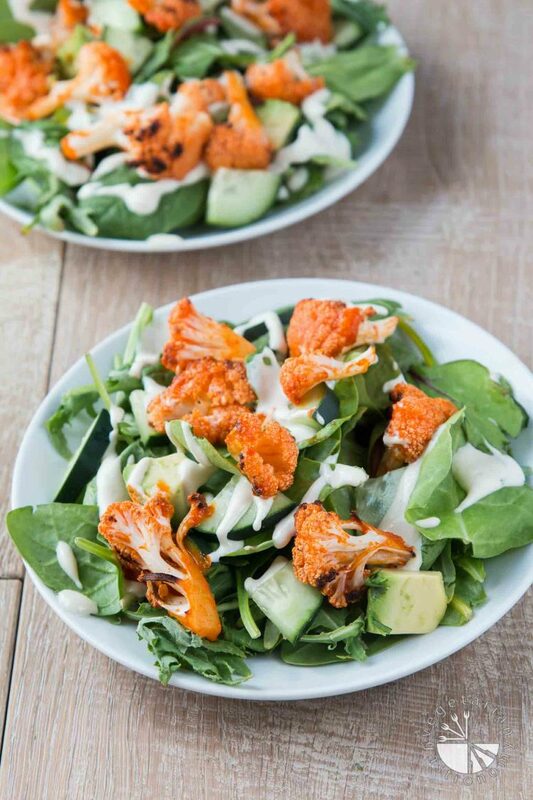 Roasted buffalo cauliflower, mixed greens, avocado, and cucumbers topped with my vegan cucumber ranch! I STILL stood over the counter and devoured the entire plate of salad. The roasted cauliflower added a nice tangy crunch to the salad, and combined with the creamy avocado and cool cucumber ranch, it was so good! I didn’t miss the breading at all. 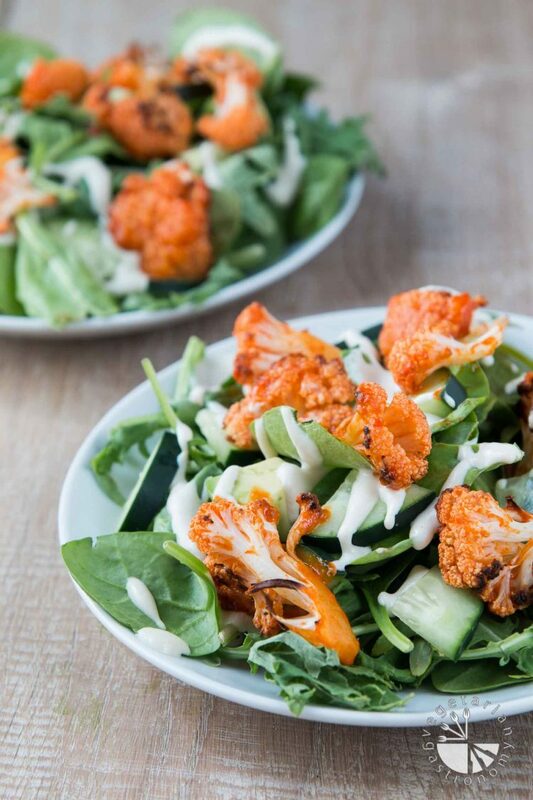 This simplified version of roasted vegan buffalo cauliflower pairs much better with the mixed green salad. Who knew that my lazy meal would turn into a recipe I’ll be making weekly?! If you haven’t tried my baked vegan buffalo cauliflower bites yet, I HIGHLY recommend them first, as they are amazing and I’ve loved seeing the re-makes on Instagram by some of you. 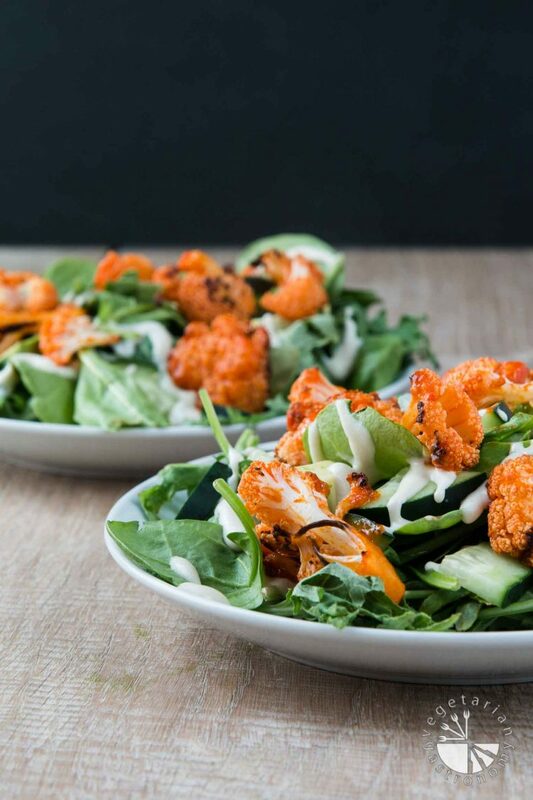 But if you’re craving that same delicious spicy, tangy, flavor, don’t have as much time, or are bored of your typical mixed green salad combinations, try this Buffalo Roasted Cauliflower Salad recipe and let me know what you think! It’s great warm or cold, and perfect to pack for lunch. I kept it simple with the ingredients, but you can just as well throw in any additional nuts or seeds for some added texture, protein, and healthy fats. I’d love to see and share your re-makes on Instagram or Facebook if you try this recipe out! Be sure to tag me both @vegetariangastronomy #vegetariangastronomy so that I don’t miss it. Tell me in the comments below, what’s your lazy go-to meal for lunch? Or what meal would you love to have a quick and simple version of? All of the tangy, spicy, bold flavors transformed into a mouthwatering easy mixed green salad! Place in the oven and bake for 15-18 minutes until crispy and slightly golden brown on the outside. Once the cauliflower is roasted, remove from the heat and toss a few at a time to completely coat in the sauce and place it back onto the same parchment paper. Place the cauliflower back in the oven for about 5 minutes. Once done, remove from oven. Split the mixed greens between two plates. Top both with some diced avocado and cucumber. 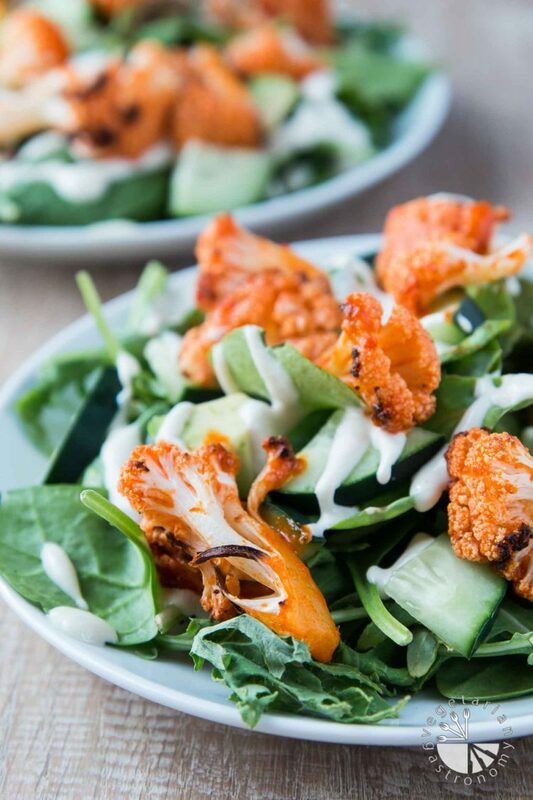 Split the buffalo roasted cauliflower between the two plates of salad, drizzle with Vegan Cucumber Ranch, add some freshly ground black pepper and enjoy! Feel free to top with some nuts or seeds for added texture and healthy fats. You can add any additional nuts or seeds if you want. I totally am the same...which is why i realized i NEED something satisfying and filling otherwise i'm reaching in my fridge or pantry again an hour later haha! What a GREAT new years resolution!! I'm so excited to hear about your cooking adventures! And YES please do post pic if you try out any of my recipes! Would LOVE to see them and reshare!! This looks like a marvelous just-sorta-happened meal! I always love the combination of cold crisp greens with something warm and roasted and in this case spicy on top. Skipping the breading saves time and with all the flavor in that sauce I'm sure tastes wonderful still, but even the crispy ones version on top of a salad would be delicious I bet. Now we have options :) Yep, could definitely see getting in lots of greens this way! Thanks Natalie! Yeah I think i just wanted something quicker and went for the unbreaded version, thinking i'd crave the other, but I didn't! Both would go really well in this salad, but I love enjoying the plain version! It was so delicious, fresh, and tasty. After photographing this, I combined both plates and devoured it ha! Buffalo cauliflower is not a classic! Great for a salad! I love salads and this one looks delicious! The buffalo cauliflower is a must try! thank you! you'll love this salad combo! You've taken some of my favorite foods and flavors and put them in one delicious bowl. Looks amazing! Thanks Linda! It was a total last minute throw together one day and i ended up having it the entire week ha! Love when that happens! The cauliflower looks delicious! I love how simple and healthy this recipe is. Thanks luci! the un-breaded version has a nice crunch to it and tastes so good! The cauliflower must have a wonderful kick to it! It sounds great and so simple. It does! Nice and tangy and full of spice...couple with the vegan ranch this dish is one of my favs! I think this is a brilliant recipe. I've never seen anyone make buffalo cauliflower and the dressing you made is such a perfect combination of ingredients to balance the heat. And it's so pretty! Thank you valentina!! i typically bread my buffalo cauliflower, but this dish tasted so much better without the breaded version...and I do have to say that vegan cucumber ranch is ah-mazing =) I've had so many non-vegans love it! This is my kind of salad! I can't wait to try your cucumber ranch dressing. Thanks Amy! You will lOVE the cucumber ranch! I've been told so many times that it's just like the real deal if not better!! I love easy and tasty meals like this - especially if there's buffalo anything involoved! oh! I lvoe everything thats gone in this salad! Love all the shots too. thank you! It was fun photographing this one! This sounds absolutely delicious - LOVE the addition of the buffalo cauliflower - I am sure it takes it to the next level!! What a gorgeous looking salad! I could eat this all day every day. So yummy! I LOVE your cucumber ranch dressing and I love buffalo cauliflower so I know I'd devour this in a heartbeat!! Such a great idea to skip the breading - so much easier, but you've still got the flavor. I'm a huge fan of adding cooked/roasted veggies to my salad, but for some reason I haven't thought to add buffalo cauliflower!! I'll definitely have to give this a try! Thanks Mandy!!! You would LOVE this salad...and yes so much easier to skip. I honestly thought i'd really miss the breading, but totally did not and loved the extra crunch of the cauli paired with the ranch and avocado for extra fat! Let me know if you try! I made this just now and my cauliflower wasn't crunchy after the second bake with the sauce. I even baked it for longer than 5 minutes. Can you tell me how to retain the crunchiness after baking with the sauce? Hi! So the cauliflower for this recipe is not meant to be crunchy, but rather have that roasted taste to it. You can get the edges slightly crispy, but without breading it, you cannot get plain roasted cauliflower to be crunchy. 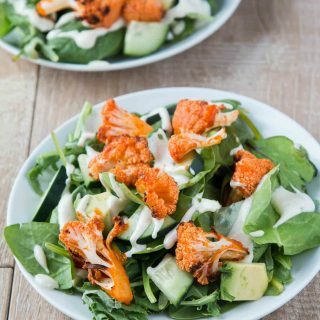 If you're looking for a crispy buffalo cauliflower, try making my Buffalo Cauliflower Bites instead and then add them to this salad! Sorry for the confusion, but this salad was meant to just be roasted buffalo cauliflower with the sauce only, not breaded. They will definitely be crispy once coated with this recipe, which I do quite often and then add these to the salad if you want that crunch: https://vegetariangastronomy.com/buffalo-cauliflower-bites-vegan-ranch/ Hope that helps! Let me know! This is just delicious. Super easy to make. I didn't have time to make the dressing (but it sounds amazing), so I just used a creamy cilantro avocado dressing. Thank you so much! So glad you loved the salad...it's one of my favorites! Definitely give the dressing a go next time...it's a staple and my FAVORITE. I don't like cauliflower but roasted tested good. We love your salad.